Dapper – one who daps… Dapping is an old English description of the technique of dangling the fly from your rod in front of a fish that is too close to cast to. Whilst I’ve tried it myself a few times over the past 40 years (without success) it was only very recently that I first heard the term "dapping" applied to the technique. Bunny caught the first fish, a triumph of a trout, some 25 dark inches long, 5 lovely pounds of angry jack, tricked by a fat minnow. Norman smiled with pleasure at the bride’s success - and flailed at the water with greater urgency. 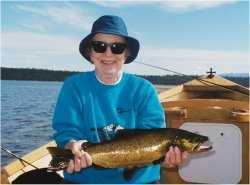 Bunny caught the second fish, a plump hen, of gorgeous hue all gold and green. The dapper, Mr Hawkins, smiled through lips grown thinner. The pressure grew intense… day 3 came and went. Trout galore, all oblivious to assorted flies. Some teased, showed interest, turned, looked, and turned away. 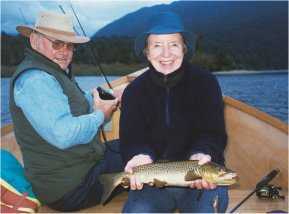 A couple mouthed a Mrs Simpson, others spurned a Hamill’s Killer, or bolted at a red Rabbit lure. Hard work indeed! The dapper, Mr Hawkins, grew less effusive, more intent, determined. The first hints of damps and dullness, mist and drizzle showing rain’s intent. Forest rivers beckon. A venture up the Orangipuku River did the trick, a treble. Two to the net, one busted off around a trailing branch. Pride restored, honours evened, faith restored in fisherman and guide. Frankly speaking, the guide was growing concerned as well, his usefulness in question… Mr Hawkins, ever polite, was surely wondering if his efforts were to be in vain. Not lack of fish, but apathy the challenge. 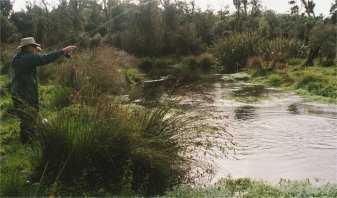 The Orangipuku is a delightful trickle, logs abound, short runs and ripples. Large fish, though few, fed strongly in inches of water close to cover. The #14 Flashback spoiled their day. Listened to the ghillie, his casts flew straight and true. The next ignored our morsels, time and time again. Some 30 casts without an error, still no interest. I opened up the tray of flies, hidden in my vest. Mr Hawkins, wary fish were log, threw a last despairing line. A savage hit took Flashback in, another gorgeous catch! And shouts of triumph matched the anglers grin! The next day we returned to the Orangipuku, intent on repeating the previous day’s pleasures. A change of tactics, walking downstream through the paddocks, with agility avoiding a sequence of electric fences without incident. Rain threatened, clouds sodden, mists swirling low along the ranges. Cooler. The spring-fed Bruce is low, a drain with fish… weed-choked, scrub-covered lower reaches, flax’s tall and tangled. A river?… it’s a term used loosely here. 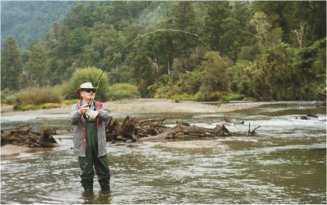 Mr Hawkins cast to a feeding trout, an awkward lie under an overhanging branch. Several tries, a twig, a lucky retrieve, but then a line shadow too far. Spooking fish propels upstream, V-wave revealing his destination under a large log. Gone! Downstream 30 yards a fin and ripple, something tasty sucked into a gaping maw! We retreat, hearts pounding, and take a circuitous route through the rushes and brambles to a downstream position, to the spot marked "X". Where is that fish that took that fly? A yard away, no more! "What now?" from Mr Hawkins? As he pushes the rod tip over the top of the rush bush, he pauses with another question. "What happens when I catch him, what to do about the logs and branches downstream" he says, with a worried look. "Lets just deal with one problem at a time" I say, "First things first… " and, muttered under breath, "Just give the damned trout the Pheasant Tail, and worry about everything else later." A panicked surge for brush and tree. "Not my bloody problem, mate! I’ve done my part,"
"Found the fish, explained the dapper’s art,"
"The rest is up to thee!" This moment shared, a bond forever, as neither of us have seen this deed done before. We walk, content, back to the truck and know that this morning’s entertainment will be relived in both our minds until the day we cease to be. Hidden by the rushes on a perfect autumn day. This to me is the essence of fishing. A fine companion, a shared experience, and a few moments of exaltation and good humour that will last us both our lifetimes. 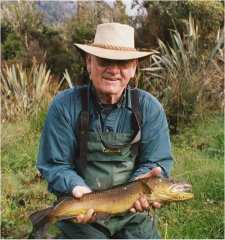 I give frequent thanks to the decision to become a fishing guide, and for the companionship of fine men such as Norman Hawkins. It is both a privilege and a pleasure to share their company on the riverbanks, to tell, and to listen to, tales of previous trips and adventures. An even greater pleasure too, when circumstances usher our way a new legend to recount to other friends, and clients yet to come. Days like this are truly golden ones, oft-savoured. I give frequent thanks also for living long enough to learn that what matters most is being there, not what goes in the creel…. "Thanks, Norm – I’m still chuckling, mate!"